As I was thinking about last week’s episode on confusion and why staying in that state doesn’t serve us, I had a realization about what has helped my clients, and myself, succeed explosively. What I’m sharing with you today is how you can create an unshakeable trust within yourself to prevent confusion from coming up! I’m delving into the “secret sauce” that has led to amazing success for the people I work with, and why creating trust and giving yourself opportunities to fail is so important. Looking for answers and specific steps for growth is natural, but I’m exploring why I have learned not to do this along the way. 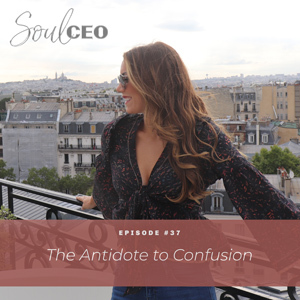 Tune in for an extension of last’s week podcast to learn more about why confusion is so unhelpful and how we can learn to attract and draw people in by kicking it to the curb! The antidote to feeling confused. What has helped create explosive results for myself and my clients. Why I don’t look at factors outside of myself if I fail at something. What will attract people to you. Hello, how are you all? You will be getting this episode one day before Chris and I head out to a couples goal setting retreat in Austin, Texas. I am so excited. I cannot wait. We’ve been doing some like, pre-work for this retreat and it was so just fun and interesting and such a cool learning and growing opportunity for both of us. And it makes me so excited because like, these are the things that I dreamed of doing with my significant other, and now I get to experience them. Like, being with somebody who wants to also do this work, and who wants to go to retreats like this. So I’m super excited. Anyway, I am so excited about today’s topic as always. Last week I was talking about confusion, and I sent an email out to my list about confusion and this idea that it is a lie, that essentially, it’s just a thought we’re having that we believe that creates the feeling of confusion. And the antidote to it is not finding an answer. It’s just not believing this lie anymore and believing we’re going to find an answer and having trust and certainty within ourselves. And through that process of kind of writing about it and thinking about it and doing my own deep work on it, I talked a little bit in the email and I wanted to expand on it here, this idea that the antidote to confusion and really, like, the secret sauce to my clients who just explode and do amazing things and I believe the secret sauce to what I’ve created. And so I wanted to share that with you guys today because obviously, I’m here to serve you guys and I want to share like, these things and the importance of them so that you can implement them into your lives. So, what is the antidote to confusion and what is this thing that creates like, explosive results for myself and my clients? It’s going to be something probably that you don’t really expect, and the answer is certainty. Like, having unshakeable certainty in yourself, in what you’re offering, in the work that you do in the world, in yourself as a significant other and just all of the things. I’ve realized that when you have certainty, and you could also compare it to kind of belief, but some of you guys might connect more with the word certainty. Like, everything else doesn’t matter. When you are certain that you’re going to find a way, find a solution, find an answer, it doesn’t matter if you aren’t sure what you’re going to do next. It doesn’t matter if you fail, right? Because if you’re certain in yourself and you’re certain in what you’re creating in the world, then you just get right back up and try something else. You just keep walking the path. And as I was thinking about this, I was kind of looking at my own journey in getting here, and I kind of – I was wondering like, why have I been successful and why have I gotten such massive results without searching for other things, searching for answers or being told exactly how to grow my business? And I know that I talk about this a lot, but like, no one ever told me how. How to post on social media, what to say, how to say it, what photos I needed, how my website needed to be. Like, no one ever gave me this drawn out path and the thing was I never really looked for that. And I was wondering why because a lot of people come into my world and they want answers. They want to be told what to do. They want steps one through 10 on how to get their clients or how to post on social media. And while I will share what I’ve done and what’s worked for me, I’m on a greater mission than just giving my clients answers, and I’m on a greater mission than just searching for answers outside of myself to create the results that I have. And so as I was thinking about this, I was wondering like, why have I never really searched for that? Why – when I don’t get the results that I want when I fail, why don’t I immediately go to adjusting my Facebook ads or my free training or looking at these things that are outside of myself to see what went wrong? Instead, I look at like, how I showed up because all of the things that I do, all of the actions that I take, I’m the common denominator. I’m the factor – I’m the common factor that’s at play here. And so I always self-evaluate and not in a way where I blame myself, but just in a way that I look at okay, so like, where was I misaligned, where was I not taking action from a place of certainty or from a place of belief? And looking at it that way because I really don’t believe the answer is in the how. And I’ve never really looked for that through this path. I can’t say that there haven’t been moments that I’ve wanted to look for that answer, but what I always go back to is that if I just trust that the results are coming, if I really believe that I’m going to find a way to get there no matter what, that I’m going to try different things, that I’m going to test something out, that I’m going to try out a training, that I’m going to be willing to fail because I know that I’m going to learn something and then I’m going to try something else. And that comes from certainty. That comes from certainty in yourself. That comes from trusting yourself and knowing that you are going to get there somehow, someway. So the thing is people can feel certainty. When you have certainty in yourself, when you have certainty in what you offer the world, when you have certainty in the process that you follow, people feel that and sense that and they’re drawn to it. I want to give you guys an example. If we all got stranded in a cave somewhere – I really love to use funny examples – and none of us had ever found our way out of the cave, if I just stood up and said, “Alright, we’re going to find a way out of here, we’re going to all be okay, we’re going to live, we’re going to survive, we’re going to find a way out of here,” and the reality is that I don’t know how to get out of the cave in this particular example. Let’s just say I don’t know how we’re going to survive, I don’t know how we’re going to get out of the cave, I don’t know exactly what the whole path and the whole process looks like. But I don’t sit there feeling confused or feeling stuck because I just have certainty in myself that I’m somehow, someway going to find a way out of the cave and that if one path we take doesn’t work, that we’re going to find another path. We’re going to try something different. And that doesn’t come from having an answer. That doesn’t come from being told how to do it. It comes from an inner unshakeable trust and certainty in yourself. And that, my friends, is what will attract and draw people to you. That is what will grow you massively. That will be what gets you through at every single level, to the next level. This is how I always know that no matter what, I’m going to get what I want. I really believe that. It may not be pretty, it may not be perfect, it may not be how the “experts” say to do it, but I trust I’m going to get there and I’m going to find a way to get there because the reality is if there was only one right way to get there, if there was only one right way to do this, then we would all just follow that perfectly. We would just follow the steps. But the reason why it works is because of your certainty in yourself and your certainty in what you’re offering and the certainty that you have in following that path within yourself. It’s not about the actual path. It’s not about the actual how, and this is why people are successful. Even people that offer step-by-step to-dos of how to get from A to B, it’s because they believe in their process. It’s because their certain of themselves and they’re certain that they have followed this and this is what has worked for them. That’s what makes it work. How we know this is I have clients who post differently on social media, who do different things, who offer different things, who reach wild levels of success, and some who don’t. What’s the difference? No, it’s not their marketing strategy. No, it’s not these external answers or these pieces. It’s their certainty. And that creates certainty within you too, right? For you to come to me and look at me and say, “I don’t know how I’m going to do this,” and me to say, “Well, we’re going to find a way how. We’re going to work together to figure a way out of this. I’m going to help you uncover it within yourself.” My job is to show up in certainty when you’re uncertain. My job is to help you find the answers within yourself so that when you get to the next level, you just have this unshakeable trust that you’re going to figure it out. I don’t want you to feel like I’m your answer or that your social media posts are what got you your results, or whatever it is, or your Facebook ads. I want you to feel like no matter what happens, no matter if Facebook burned to the ground and never existed again and the internet just totally died, that you have an unshakeable trust within yourself that you could find another way. And that is something that’s like, so intangible and hard to almost explain the value of but it is the secret sauce. My clients that excel, my clients that succeed, myself included, we have an unshakeable certainty that we’re going to get there eventually, that through the failures, through the challenges, through all the things, because I promise, if you guys are on a journey of bettering yourself, bettering your life, elevating your business, you are going to fail, you are going to have challenges, you are going to fall flat on your face sometimes. It’s a part of the journey. I’m not saying it has to be hard, but it’s just a part of like, figuring it out and working and growing, otherwise you’d already have what you wanted if you were that aligned and you were matching the vibration of what you desired already. Then it would be easy, it would be simple. You would already have the result. How you would know that you were showing up in alignment with that result is if you had it. Period. So the question then becomes how do you create this certainty is you give it the opportunity. That’s like, the idea of like, how do you build trust, right? You have to give trust. You don’t just like, wait to give it away. You have to like, give it and give people the opportunity to like, fail and to do the right thing when nobody’s watching. That’s how you build trust in them. That’s how you build trust in yourself. So, how you create certainty is you start to ask yourself, if I knew that I was going to find a way to get this result, what would I feel like doing next? What would I feel like was the next step? If I knew I was going to get there eventually, what would I do first? What would I do now? And to try it and be willing to fail and then survive the failures and to survive the missteps. That’s a whole ‘nother piece of certainty, right? Is like, when you aren’t afraid of failing anymore, when you aren’t afraid that if you mess up, that you’ll be okay on the other side, then you’ll be willing to do it. And when you’re willing to do it, then you’ll be willing to do whatever it takes to get what you want. That’s how you build certainty. You build it by giving yourself the opportunity to fail, by giving yourself the opportunity to trust yourself and to trust that next step. Then you will always know within yourself that you can find a way to the next level, that you will find a way to make it happen. And it’s something that – it’s hard for me to even put into words the way that it feels to just know that no matter what happens, you’re going to be okay, and that no matter what challenges and no matter what failures and no matter what level you’re trying to reach in business, that you can find a way. I really believe that about myself. And that’s what just keeps me working at it every single day. So certainty is what makes you magnetic. It’s what draws people to you and it comes from inside. It doesn’t come from external things, it doesn’t come from evidence. Your brain might be looking for evidence to have certainty, but real, true, rock solid, unshakeable certainty comes from within, and the only way that you give it the opportunity to be built is you give yourself the opportunity to figure it out, to do the work, to fail. Then on the other side you see that you’re okay and you figured it out. So I love you guys. I’m so excited to hear your feedback on this, and this is such a deep realization that I had about what makes me and what makes my clients so successful, and really what I do in the world for people is creating that certainty, is creating that unshakeable trust, is creating space for people to believe in their way and their process. Not to do things the way that everybody else says to do them. To do them the way that they want to do them because if we all were following the way that other people said to do things, if we were only trusting that the answers were outside of ourselves, then we would all just do what we’re doing now, which is go to college, get a degree, get a job, and just do life the way that it’s supposed to be done. And I know that you guys listening, that’s not for you. And there’s nothing wrong with that if that’s your path, if that’s what you love, if you feel good about that. For those of you that are on this journey and this path to live an amazing life and to just push your limits and live to your fullest potential, your answers all come from within. They come from your certainty. So give yourself the opportunity to build that. That’s how you build it. So I love you guys, I hope you have a beautiful week and I’ll talk to you next week. Bye.